The sound of sizzling vegetables reverberated through the thin walls of Fumito’s family home, as the smells of a pre-dawn morning wafted towards my blocked nose. Slowly I rose, folding up the futon while stuffing my pack full of essentials for the long day ahead. 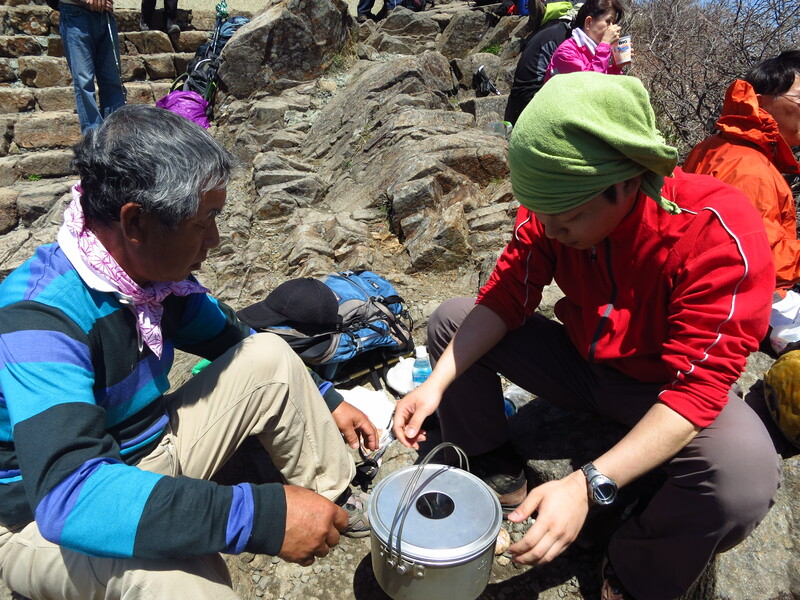 Once in the kitchen, we feasted on grilled rice balls and strong cups of coffee before hitting the road to Tsuchigoya, the starting point for western Japan’s highest peak. I know what you’re thinking. Haven’t you been here twice already? When a trusty hiking companion opens his home to you, you have little choice but to willfully oblige. Even if it weren’t for the companionship, the chance of finally scaling Ishizuchi on a cloudless day would be too much to pass up. 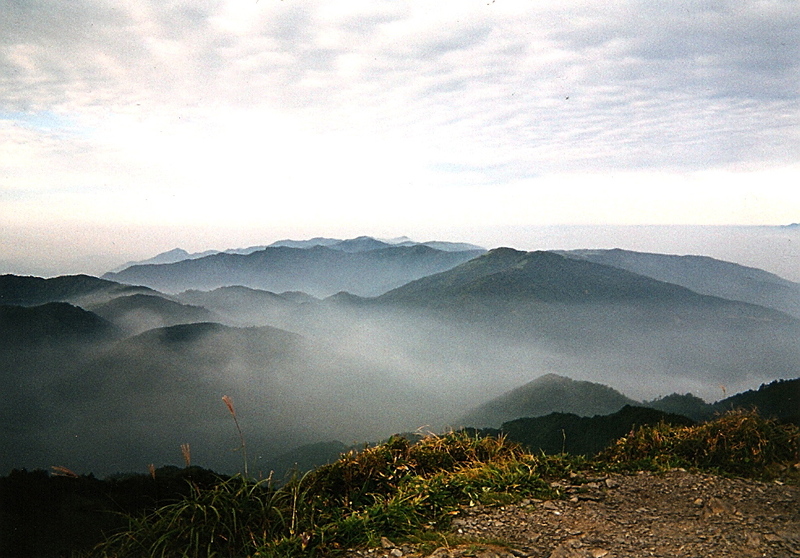 Climbing, however, was not the only task at hand, for Fumito’s father Kiyofumi had a very important task to attend to: spreading the ashes of a close friend and fellow climber who’d perished the year before. How could I refuse? After a 3-hour drive to the starting point, we unloaded the gear and set off a little past 8 in the morning. This was definitely the earliest start I’d had in quite some time, and I’d simply have to put my fatigue aside. Fumito and I kept a leisurely pace, but we were soon overtaken by Kiyofumi, who must surely have been powered by the spirit of his dear friend whose bones rested beneath his bright blue pack. We only caught up with him at the main junction just below the final push to the peak. 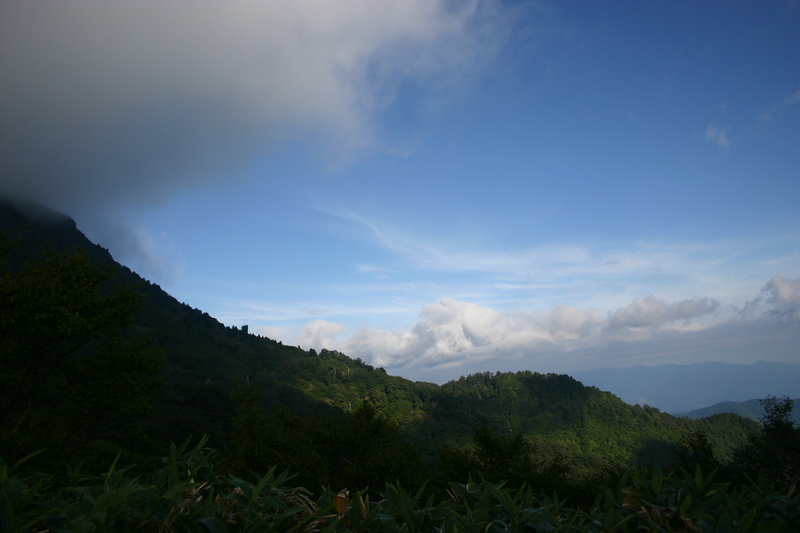 Despite the deep blue sky, the horizon was tinged with haze, obstructing the views out to the Inland Sea. Apparently on a clear day you can see Mt. Aso in Kyushu, but we had visibility of less than 20km. Beggars can’t be choosers now, can they? Kiyofumi set off up the metal stairs towards Misen, while Fumito and I battled the huge crowds for space on the thick metal chains that make Ishizuchi so famous. It was literally elbow-to-elbow traffic up the near vertical rock faces, and both of us prayed no one above would lose their grip, which would surely set off a domino effect that would be the mother of all mountain disasters. At one point we snuck over to a neighboring crevice that did not have any chains, and thankfully there were no other people to maneuver around. Japanese people are renowned for their polite style of queuing, but it literally became a free-for-all in the narrow space around the cliffs. Once reaching the top of the first set of chains, Fumito and I both collapsed from exhaustion, opting to forgo the final set of chains in favor of the metal stairs. Once on the summit, we literally had to fight for space among the hundred or so people on top, who somehow had all converged at the 11am hour. The wait to climb Mt. Tengu was nearly 30 minutes for all I could tell, though there was no one keeping track and no one in charge of letting people through. 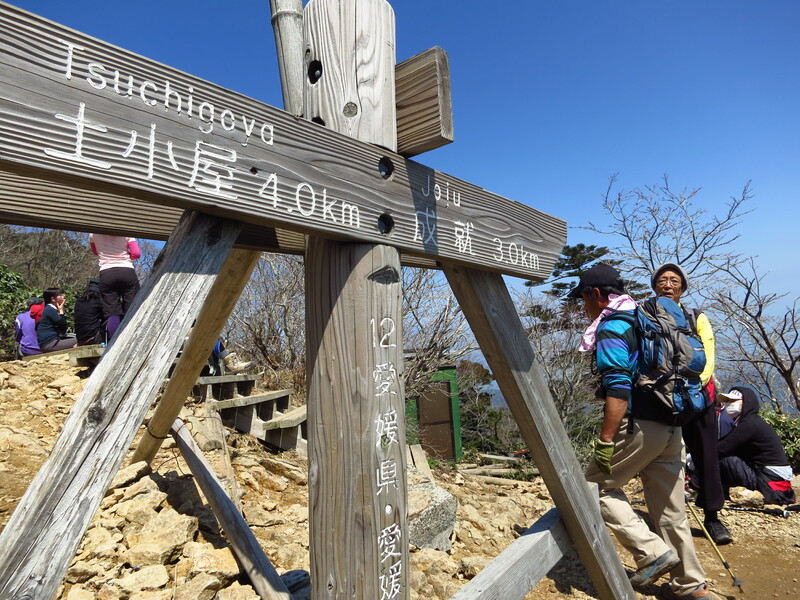 Overuse is becoming a monumental problem in Japan’s mountains, especially with the recent hiking boom among the 20 and 30-something crowd. Perhaps the locals could initiate a climbing permit system to give the ecosystem a breather. Somehow I don’t think the mountain huts would allow it though, for they would surely lose money selling their 500 yen bottles of water and overpriced meals. The wind blew in strong but inconsistent gusts as we struggled to light the fire. The temperature was at least 10 degrees cooler up here, but Fumito knew just what we needed: a dish called zosui that Fumito referred to as Japanese-style risotto. Out of his pack, the budding chef produced 2 ziplock bags of cooked rice, 3 medium strips of kelp, a bag of cut vegetables, a half a kilo of cut chicken, and 4 raw eggs! Before my eyes I witnessed the magic of Japanese cuisine, which easily put any mountain meal I’ve ever cooked to shame. 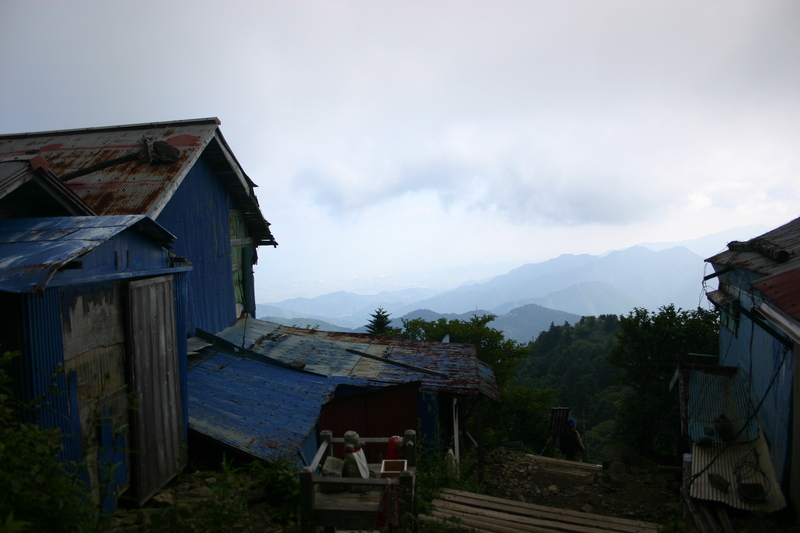 Kiyofumi grabbed a beer from the adjacent mountain hut while I struggled to breathe in the crisp, thin mountain air. My lungs were starting to feel the change from sea level to nearly 2000 meters in less than 6 hours. The zosui was devoured in a third of the time it took to cook, and slowly my stamina returned to my ailing body. 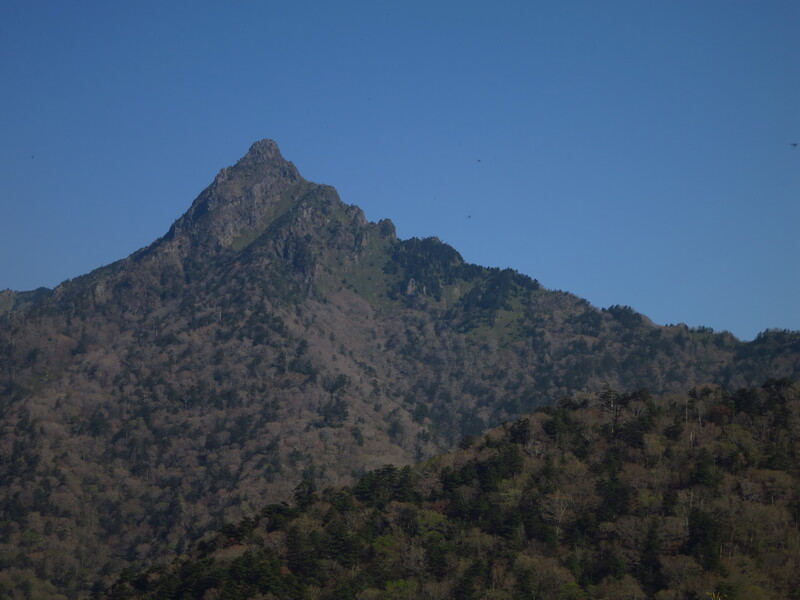 After lunch, Fumito and his father had originally planned to spread the ashes on the summit of Tengu, but because of the intense crowds, they changed tack and headed for a secluded spot on the northern face of Misen. Respecting their privacy, I stayed behind while they paid their respects at the shrine before performing a short ceremony to release the ashes back to nature. Sitting on the summit, I felt deeply moved by the actions of the Hirao family, and I could only hope that someone would do the same thing for me when I cease to become a functioning carbon-based lifeform. On the way back down the mountain, we were all in good spirits, for the weather had held out and the peaks lay spread out before us. Passing by heaps of other late starters, we offered encouraging greetings and a few high-fives to the kids making their first mountain summit. Fatigued our bodies were, but rejuvenated our spirits became, on a truly successful mission. Perhaps I need to take the old adage ‘Third time’s the charm’ to heart a little more often, though if I truly climbed all of the Hyakumeizan 3 times then someone should surely have me checked out for mental insanity. The Ishizuchi ropeway is definitely past its prime. Rust and weeds threaten to take over the entire collection of run-down souvenir shops and the gondola structure itself. Obviously the vast amounts of cash made from whisking day-trippers up to the shrine are not being spent on upkeep of the facilities. I wanted to ask the attendant if the area had been painted since the ropeway opening in 1968, but alas, kept my inquiries to myself. I boarded the aerial lift with a half a dozen other people, gazing with wonder as the machinery lifted me 850 meters above the valley floor in a little over 7 minutes. During my last trip here, I’d spurned this shortcut up the mountain, but ever since my chronic cough and asthma problems surfaced a year and a half ago I’ve been forced to save precious energy at any cost. 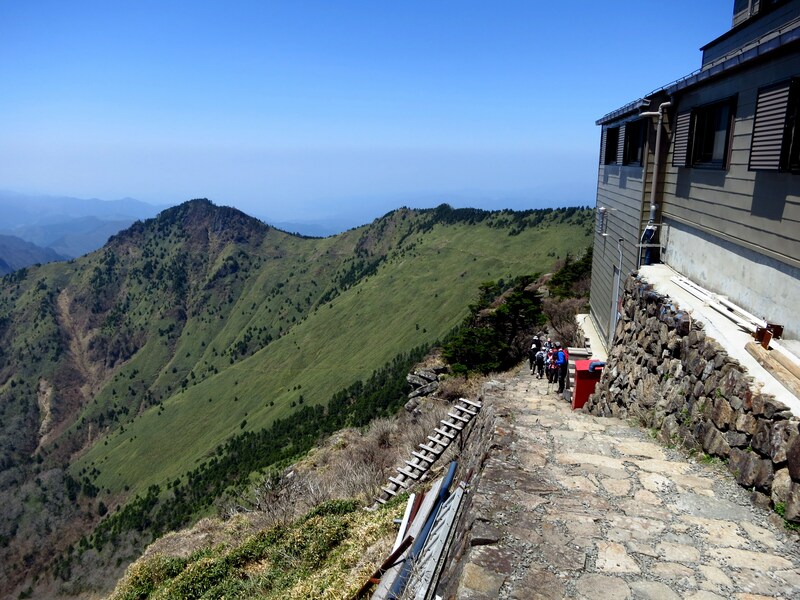 At the top of the gondola, I followed the meandering, gravel forest road to the shrine complex of Joju, where, to my great astonishment, a huge concrete pylon rose abruptly from the mountain behind the collection of rustic buildings. Even Ishizuchi itself hasn’t been spared the wrath of cell phone companies trying to give their customers uninterrupted service in every inch of this country. I wonder how the Shinto gods and Fukada himself would feel about the desecration of this holy precinct. Lunch was consumed in one of the empty restaurants while the TV blared a benign drama at an eardrum piercing decible. Why does the volume need to be cranked all the way up anyway? I checked into Shiraishi Ryokan and whittled away the afternoon exploring the shrine grounds and the sorry excuse for a ski resort. 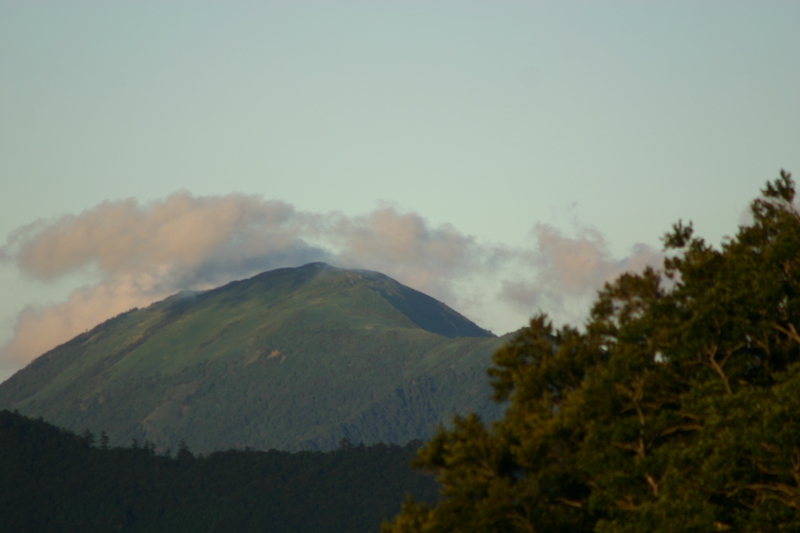 The summit was surprisingly free of clouds, a good omen perhaps to my impending ascent in the morning. I didn’t have enough stamina to attempt the summit this afternoon, a decision I would later learn to regret. Sunset was lovely as Sasa-ga-mine finally broke through out of the clouds to show her shy figure. This is another on my “to climb” list that I hope to conquer the next time round, so it was great to see what I would be faced with in the future. 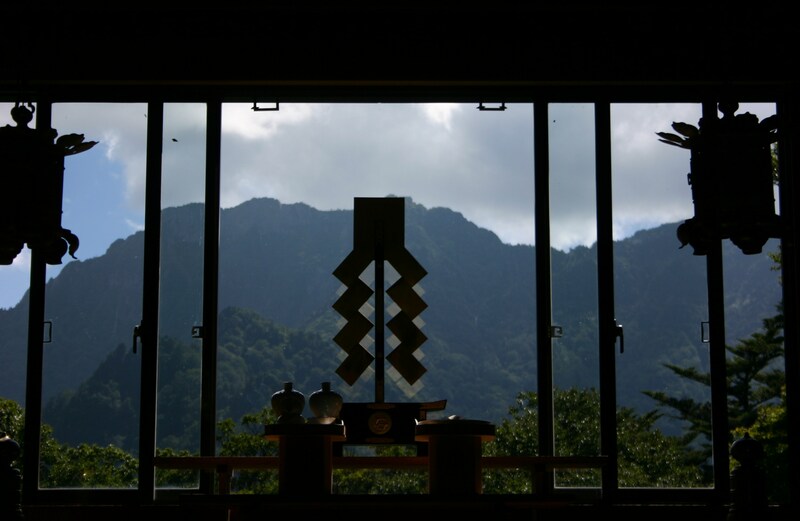 I retreated back to the ryokan and the scrumptious serving of mountain vegetables. Breakfast was served at the ripe hour of 6am, as I wandered outside to check out the sunrise. 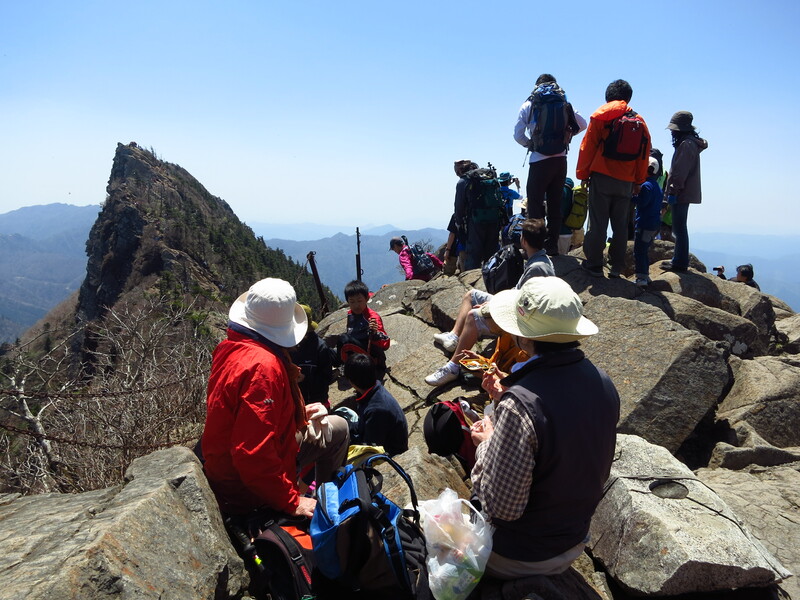 The summit was free of cloud cover as I danced excitedly back to my table to finish the morning fish and eggs. Pack on, I prayed at the main shrine just in time to see a white-clad henro (pilgrim) slip gently through the entrance gate to the mountain. I quickly followed pursuit. The path dropped a lot further than I’d initially remembered and then climbed abruptly from the saddle. 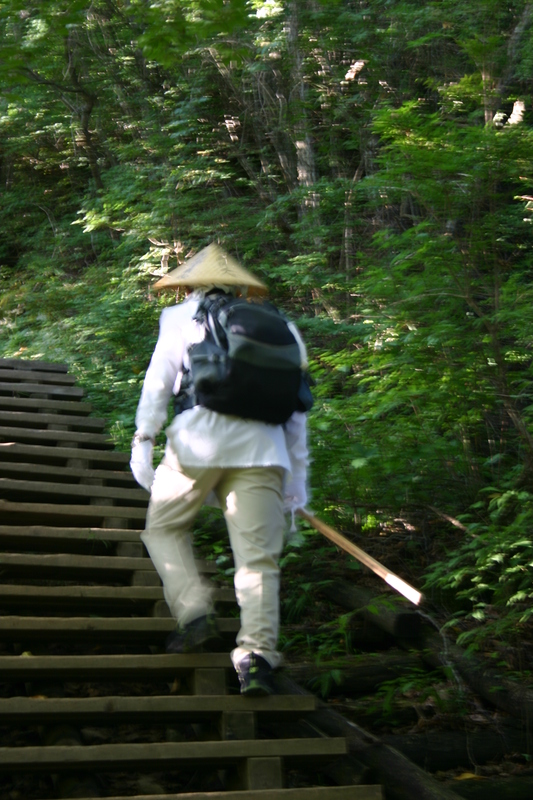 The path basically became an endless array of wooden steps for the majority of the climb. 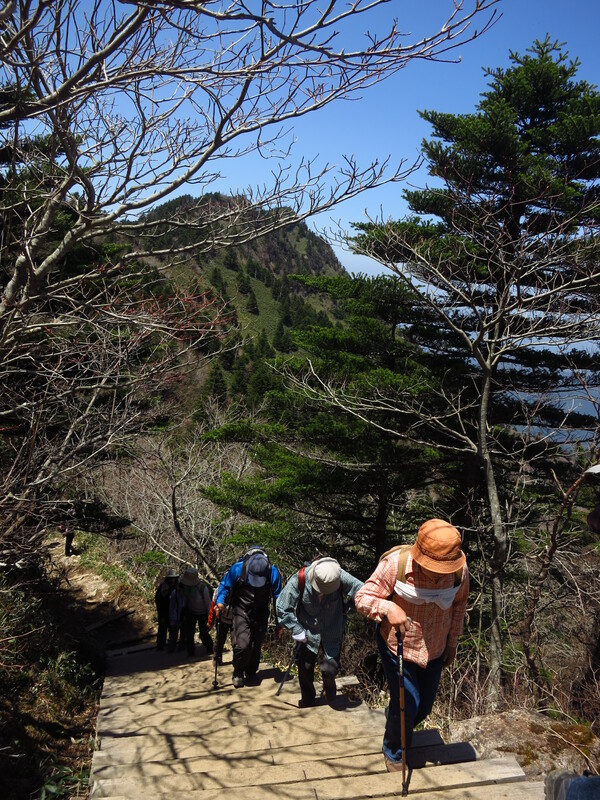 I can tell you that most of these steps were certainly not here 7 years ago, a testament to the overuse of this mountain and the rising popularity of the Hyakumeizan themselves. I reached the chain section that I’d mistakenly climbed on my first journey and quickly took the shortcut to the left. A wooden hut with tacky aluminum siding awaited me on the clearing, with a friendly gentleman setting up shop for the day. Refreshments could be bought here during the busy summer climbing season, but 7:30am was still too early to take a break. I continued in silence. 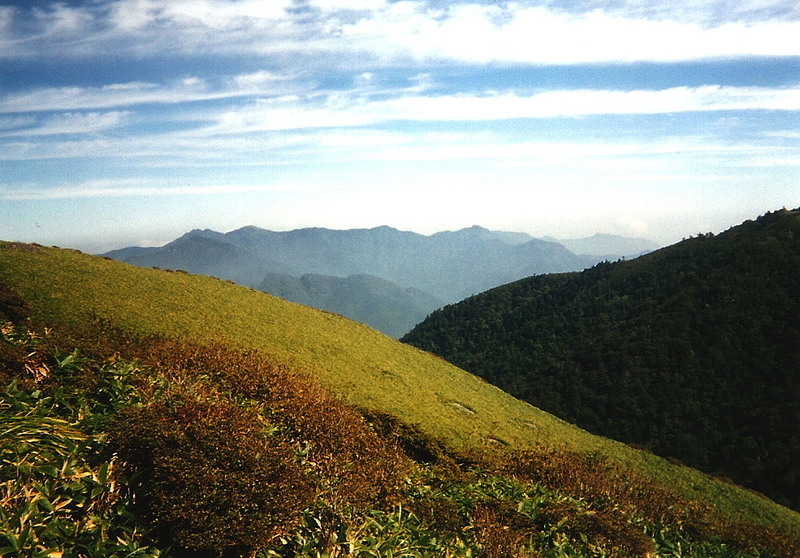 Reaching Yoake-toge, the summit plateau finally came into view. Well, sort of. 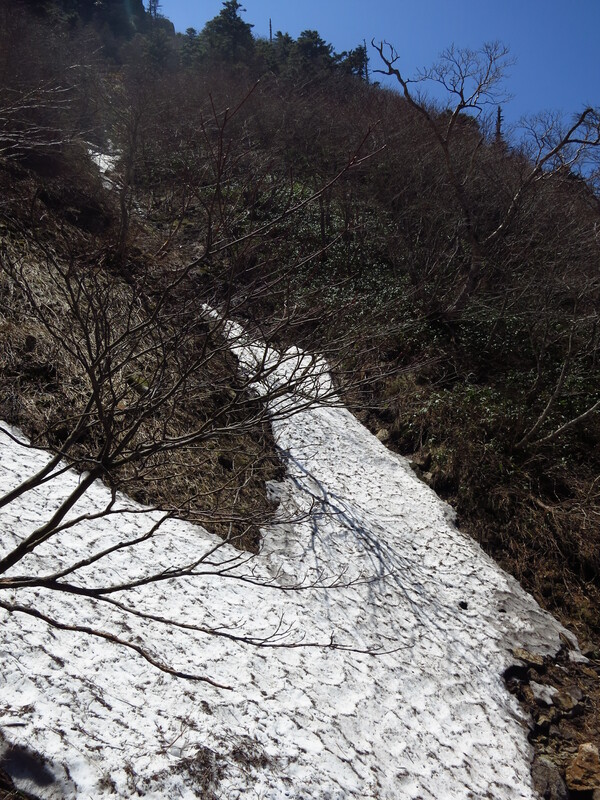 I peered up towards Ni-no-kusari hut where the mountain disappeared into a sea of white. “Wait a minute, where’d this cloud come from?”, I screamed. Dropping my pack, I sat in utter shock in the dirt of the saddle, literally kicking myself for not taking advantage of the previous day’s clear weather. Here I was trying to get revenge on a peak, and I was about to be robbed of a view! I seriously considered turning around in utter defeat, but slowly talked myself into continuing. I passed by the clearing where I’d camped in the horrendous rain storm, wondering how many others had followed in my footsteps. The hut at Ni-no-kusari looked truly deserted. It was completely boarded up and I wondered if it were open at all during the busy summer holidays. Future climbers should not count on staying here, as it looks as if the roof would cave in on itself at any moment. It was here that I had to make a crucial decision. Do I attempt the climb up the chains or take the easy detour on the metal steps? I felt the rocks and bamboo grass. Damp from the mist. I took that as I sign to stay towards the right and flew up the stairs. 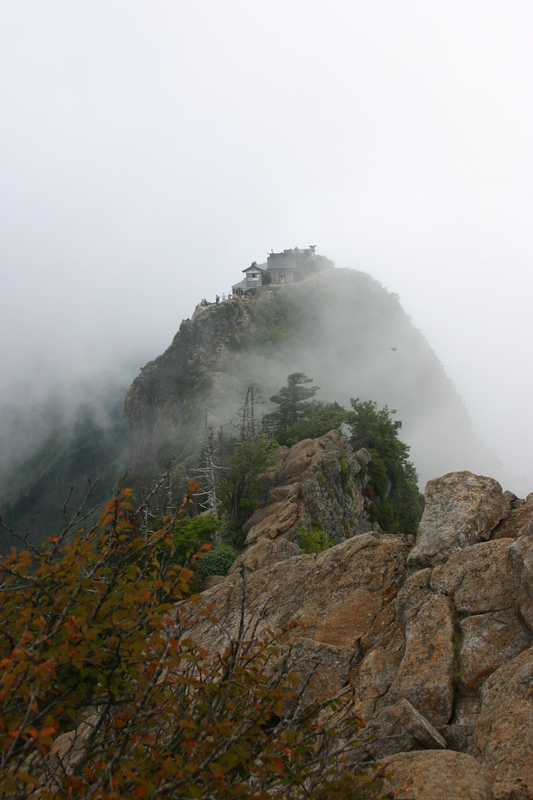 Once on the summit, I sat with a half a dozen other climbers in the thick mist and waited. 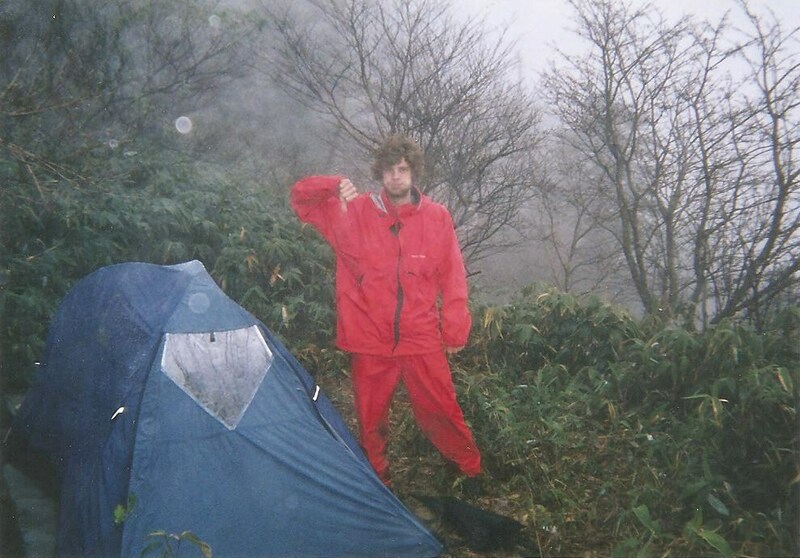 It was only 9am and I was determined to make it over to Tengu-dake if the cloud decided to drop. The air at 1900 meters turned cool, and I had to reach for a long-sleeved shirt for the first time in nearly 3 months. If only there were a way to carry this air back to Osaka, which had been suffering from the worst heat wave since record-keeping began just after the war. As I sat on the cold rock formations on Mt. Misen, a patch of blue became visible directly overhead. Perhaps the cloud would clear after all. The next 45 minutes became a fierce battle between the bright sun and the thick cloud, as slowly the views started to show themselves. Finally, the sharp flank of Tengu-dake broke out of the clouds as if to say “Bring it on!” before being sucked back into the fight. One glimpse was all it took. I dropped down the back of Mt. 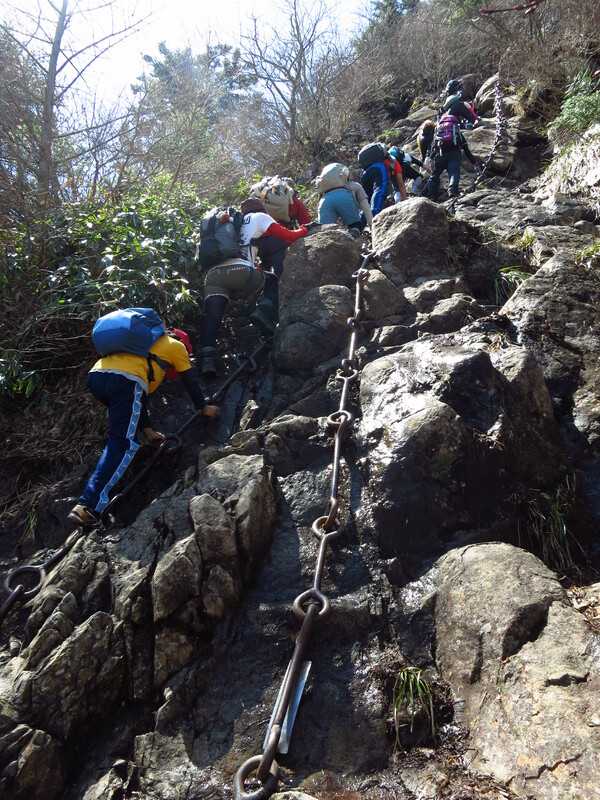 Misen, grasping tightly to the metal chains to prevent being thrown off the peak. 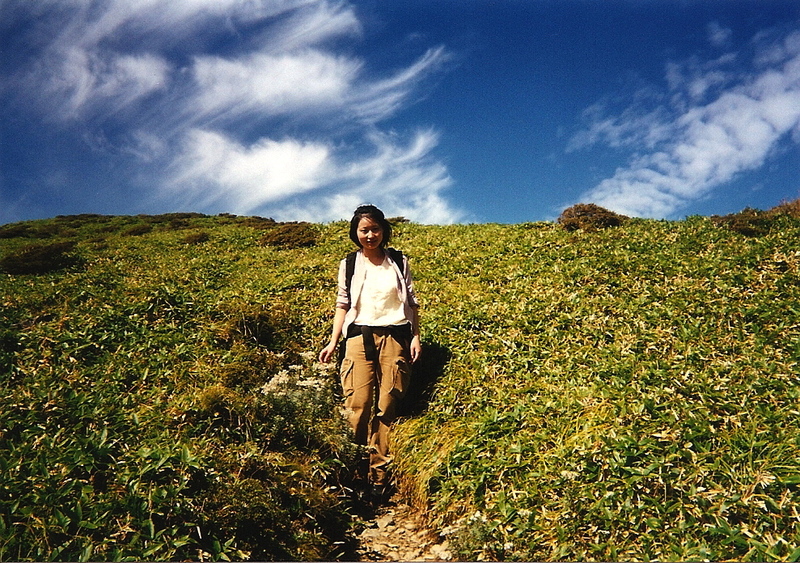 A young university student from Tokushima quickly followed suit, and I now had a hiking companion. The two of us followed the unmarked path as best we could, trying to stay away from the vertigo-inducing drops to our left, hidden by a thin layer of cloud. We reached the summit after only 5 minutes of climbing. There was no room to sit, so we stood and chatted about hiking. 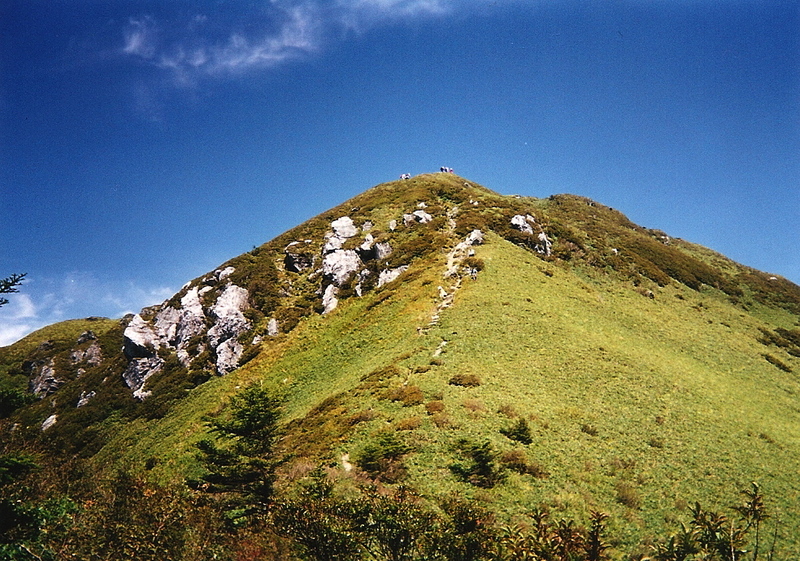 Two lone males on the highest peak in Western Japan. The cloud lifted briefly while we waved back to the crowds at Misen. Astonishingly, absolutely no one followed suit, and we had the peak to ourselves on this quiet September morning. 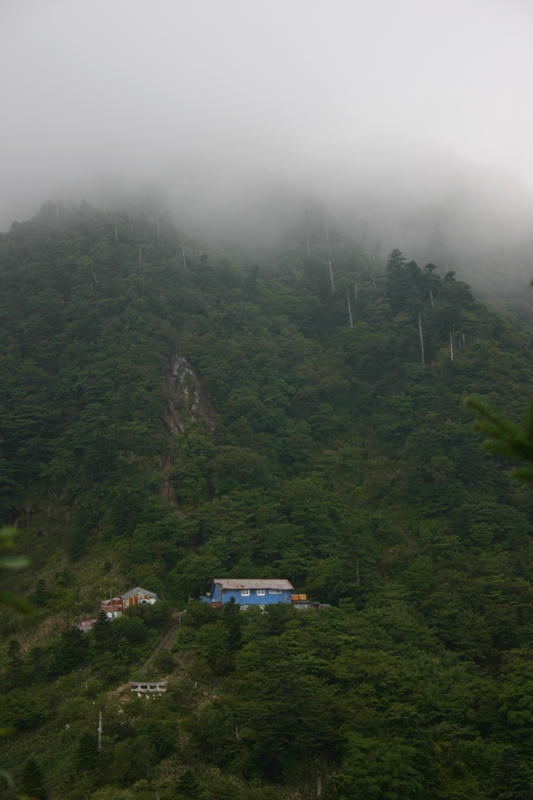 Once back at Misen, I felt a huge sense of relief. While robbed of a splendid view, the sense of accomplishment was strong. I’d won the battle with the mighty Tengu, but now it was time to get off the peak without incident. My new hiking companion kept me in high spirits and we took the right fork towards Tsuchi-goya. This was one approach I was keen on checking out. We passed countless hikers and even a few dogs on the long but easy descent to the parking lot. About 1km into our descent, a lone figure caught my attention. Dressed completely in white, with an elegant purple sash covering his chest, the elderly statesmen commanded our respect. 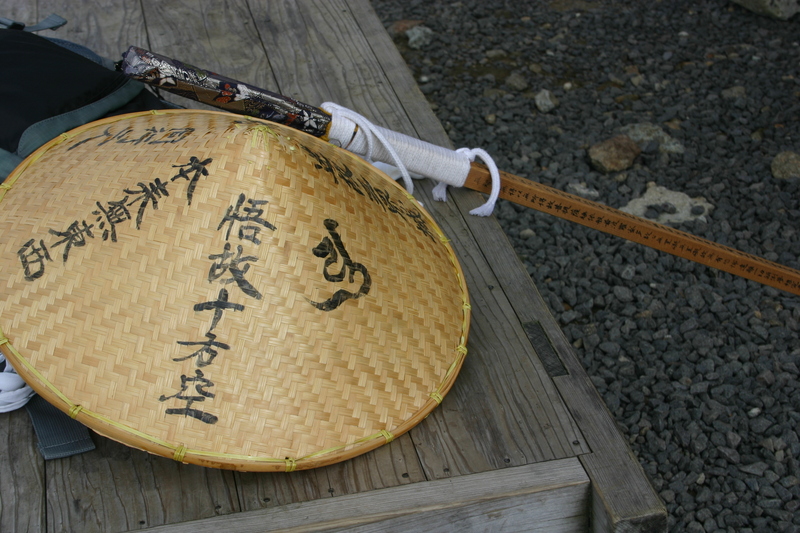 He was no ordinary henro,but a genuine yamabushi yielding a large wooden staff topped by a series of metal rings – the sign of Shugendo. Despite my various pursuits, this is the first encounter I’ve ever had with a bona fide mountain priest. We both froze as we met, as an arm stretched out to greet me. The priest grasped my hand, chanted an ancient mantra, and released his firm grip as quickly as he had seized it. An overwhelming surge of energy permeated my extremities as the otherworldly figure continued his steady climb up the peak. Back at the trailhead, we said our farewells as I entered a restaurant in search of a tasty bowl of noodles. 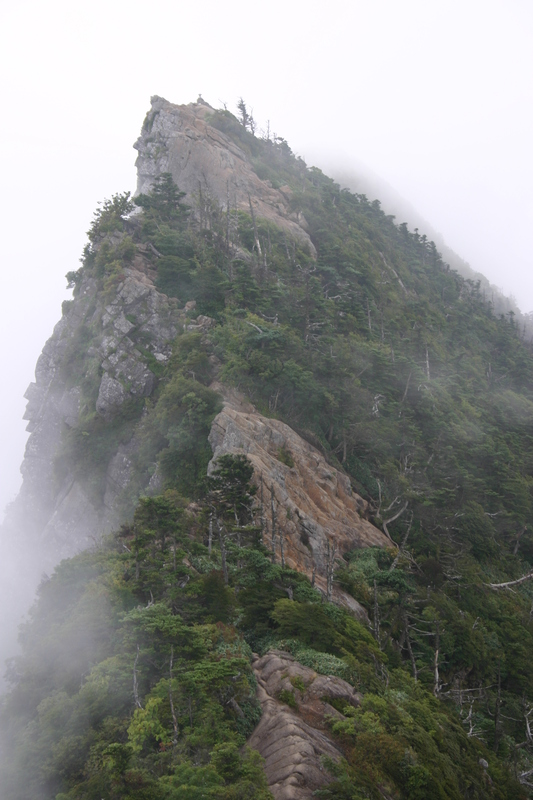 The clouds continued to cling heavily to Ishizuchi’s rocky face as I determined my coordinates. Retreating back to the road, I held out the thumb and flawlessly hitched a ride to Omogo gorge, where a new exploration awaited. Ishizuchi had been much kinder than the first time around, but thoughts of a winter ascent still stir inside of me. Someday, I promised, someday. The lights came on around 4am, rousing the passengers of the packed bus bound for Matsuyama. We were still 30km from the city, but all of the commotion was for one lone passenger, yours truly, who wanted to be let off at a desolate bus stop in the middle of the expressway. The bus pulled away as I settled in for a slumber on a weather-beaten bench in the bus shelter, rain steadily keeping time in the pre-dawn stillness. 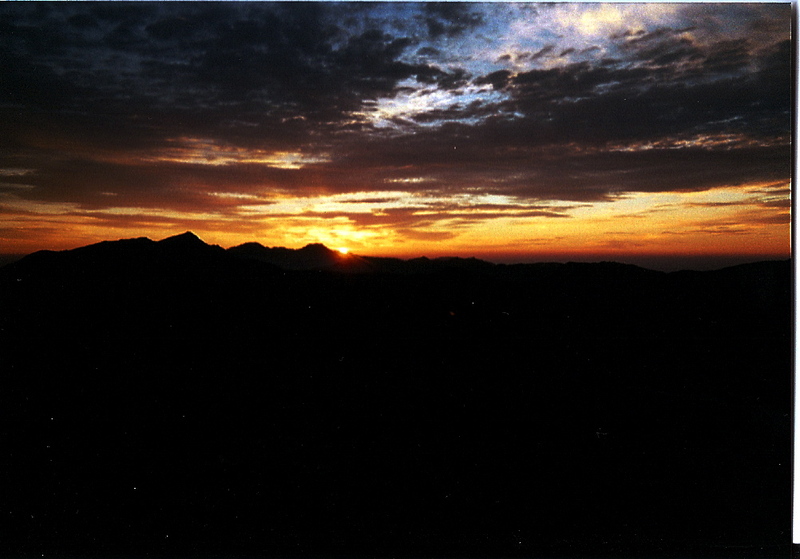 Once daybreak hit, I nibbled on breakfast and wandered out to the edge of the road, hoping to hitch a ride to the trailhead of Mt. Ishizuchi, my goal for this miserable mid-October weekend. Finding a ride to Iyo-saijo, I wandered up the rural route hoping someone would come to my rescue. Sure enough, a kind-spirited local whisked me up past the dam towards Nishinokawa, my intended destination. Reaching a bend in the river, the driver pulled off. “Before the cable car was built, this was the traditional route up Ishizuchi”, explained my guide. “This is the route you’re going to take today.” And with that the driver sped off, leaving me to plot my next move. I really had no idea where I was in relation to my map, but trusted the man’s judgment and passed through the stone torii marking the trail. 3 grueling hours later, after passing through an abandoned ski resort, I met up with the main trail at the top of the ropeway, where the masses gathered to view the fall foliage. I trudged up towards the temple complex of Joujuu, passing loads of day-trippers along the way. 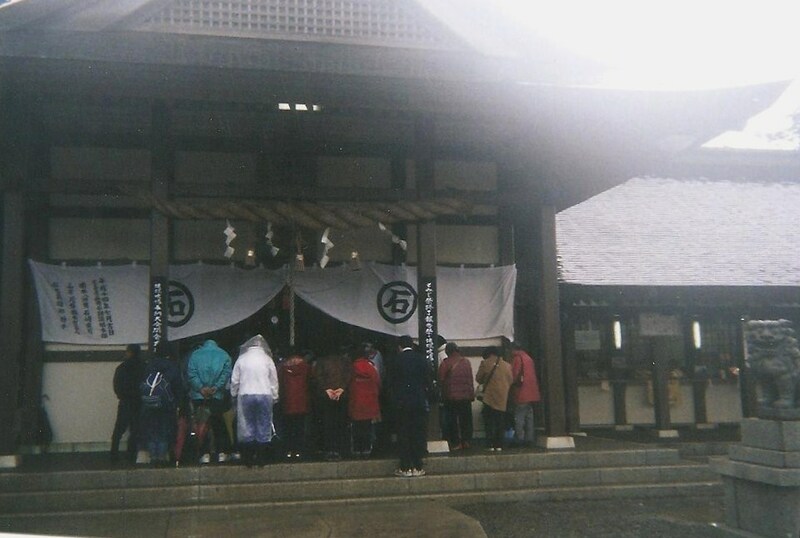 Several storefronts displayed a variety of pilgrim gear, while steady streams of Shingon faithful paid their respects at the main shrine. I sought shelter under the eave of one of the huts, filling the stomach with carbs for the impending climb. Once through the main gate marking the trailhead, the path lost about 100 vertical meters of altitude as I passed countless souls on their way down front the cloud-swept summit. At one point I shared the trail with a friendly Canadian gent, who’d given up on summiting last October because of a blizzard. I silently hoped the cool rain wouldn’t turn into a repeat of last autumn. Ishizuchi is not a place for scaling in the ice without some serious gear. After an hour of relentless climbing, I reached a junction and a set of dark, heavy chains. Little did I know that this was the area used to test pilgrims for their readiness to scale the peak. Not even marked in my guidebook, I clambered up the frigid metal links, which threatened to spit me out and hurl me down the mountainside with each advancing step. Miraculously, I reached the top of a gargantuan rock formation unscathed, but realized that an even steeper descent awaited me. Grasping the chains, I tiptoed my way down to an abandoned hut, where I met up with the trail again. “All that work for nothing”, I fumed, thinking that the chains would carry me directly to the summit. Not even close. I continued my ongoing battle with Western Japan’s highest mountain, reaching a flat area called Yoake-toge, which translates as “dawn pass”, but should be renamed kaze no mae no shizuke (the calm before the storm). The rain let up a bit but visibility remained at less than 5 meters. I dropped the pack and examined the map: 300 meters of vertical climbing spread out over half a kilometer or so. It was nearing 5pm and I knew darkness would soon set in. I pushed on towards the campsite that supposedly lay just ahead. “You call this a campsite?”, I exclaimed out of utter disbelief. I spent the next 20 minutes wandering around the hut of Ni-no-kusari trying to find the real campground. 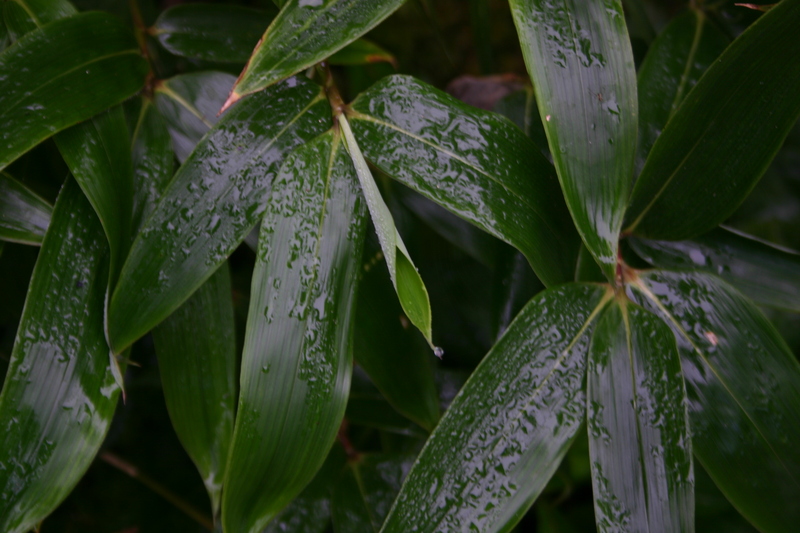 A flat area, barely 2 by 2 meters, sat just off the trail, surrounded by thick, damp bamboo grass. “It’s a good thing no one else is camping”, I remarked to myself, sitting up my tent with the attention of a 5-year old. I’d even put the rain fly on upside down in all of my hastiness, deciding to repair the damage after racing to the summit. 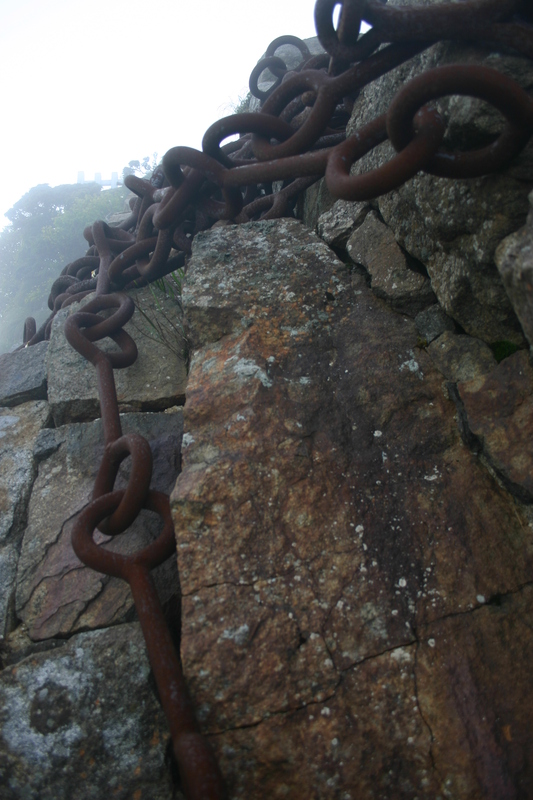 I reached the first of 3 sets of chains that most pilgrims use to reach the shrine at Misen. I took one look at the rusty links, remembering my earlier battle that zapped nearly all of my energy. “Nah, not today”, I uttered, opting for the handy set of steel stairs built to bypass these tricky sections. I knew I could always come back the next morning and climb them in more favorable conditions. 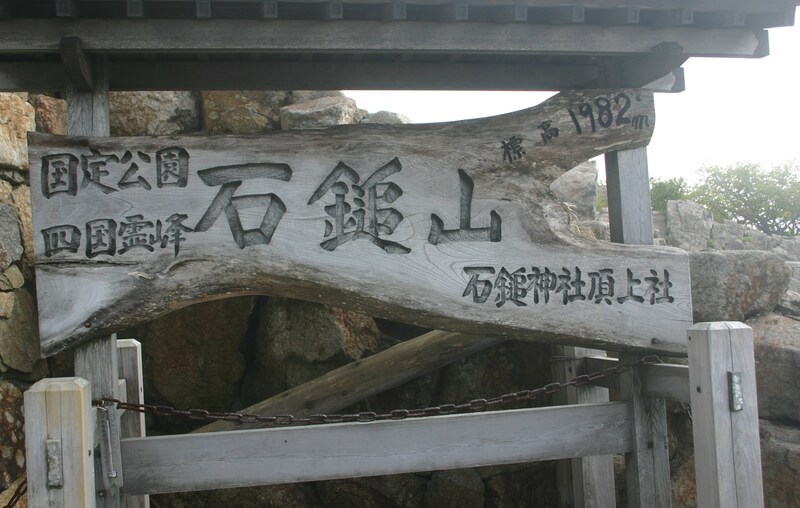 After 15 minutes or so, I reached the summit of Misen, resting on the rock formations just beside the large signpost marking the summit of Mt. Ishizuchi. Completely alone, I congratulated myself on all of the hard work. Visibility remained minimal, and only later did I realize that the true summit actually sat 100 meters to the north along a tricky, knife-edge ridge on an unmarked trail. I retreated back to my tent, cooking up a meal in the dark. Sometime around 9pm, the skies opened up, pelting my tent with large drops of rain. Luckily I’d remembered to turn the rain fly around, but the water still threatened to seep in from the aging seams. 12 hours later, I found a sizable pool of water in the corner of my tent as the rain continued its unabated assault on the rugged peak. 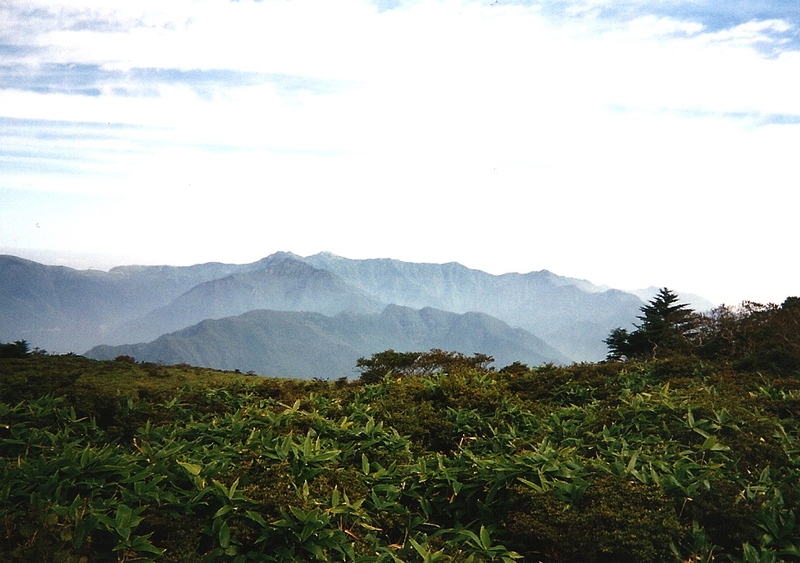 My original plan was to traverse over to Tsuchi-goya, continuing along the ridge towards Kame-ga-mori before dropping back down into the valley. I ate breakfast and waited another hour in my tent before reaching a final decision. “Screw this,” I quipped, hastily throwing everything into my pack before heading out to break down camp in the torrential rain. I’d never had a more miserable time on a mountain in my entire life, racing in utter silence down to the shelter of the forest. 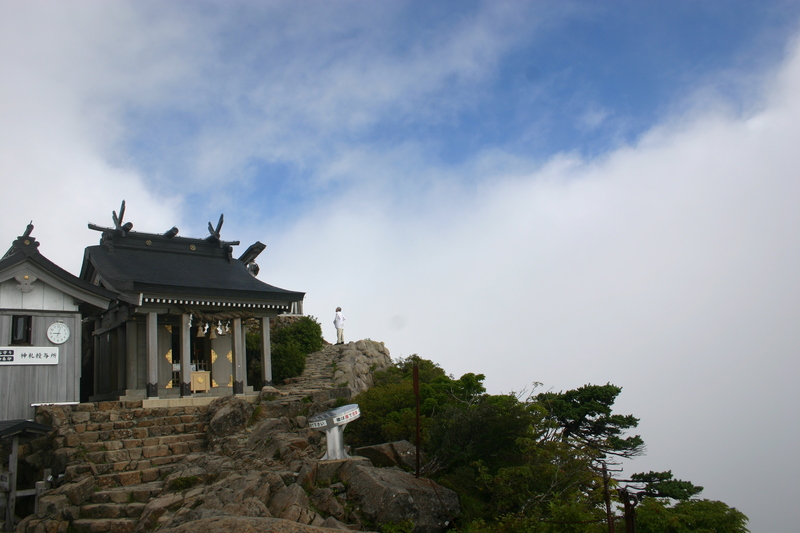 I retraced my steps back to Joujuu, reaching the shrine in less than a hour without taking a single break. I threw down my pack, sweat and rainwater flowing steadily down all areas of my body. 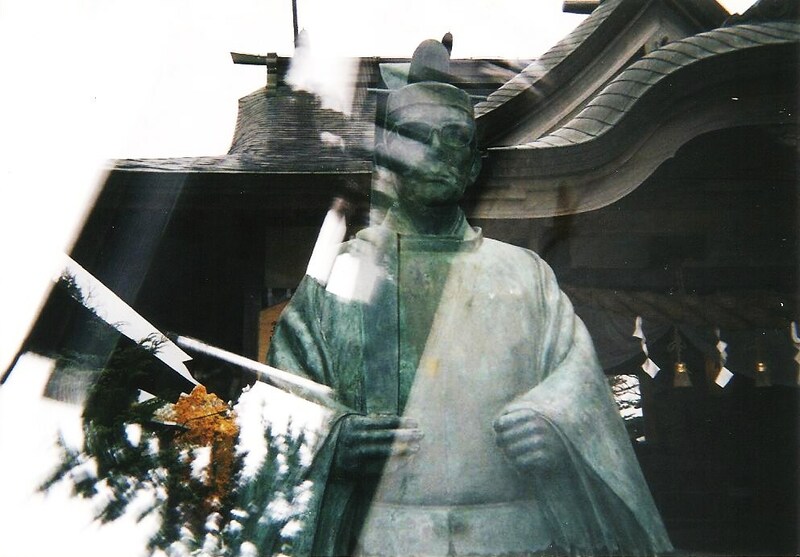 Seeking refuge, I tucked into the altar of the main shrine, stopping dead in my tracks by the spectacle before me. Dozens upon dozens of pilgrims, all donned in white, gathered in the main hall, listening to the chants of the head priest. Slowly, in unison, the worshipers raised their conch shells, belting out a tune that gave Rahsaan Roland Kirk a run for his money. I stood awestruck at the cacophony I was so fortunate to witness. Now it all started to make sense. Sometimes we get so caught up in racing up peaks we forget that the most important part of the experience lies in actually getting there: the smell of the forest, the gentle chirp of the insects. These are the things taken for granted, yet such an integral part of being out in nature. The rain was just nature’s way of telling me to pay more attention to the details. With this heightened sense of awareness, I bounced through the forest like a toddler crawling around the living room. I became utterly fixated with every aspect of the old growth forest. Even the abandoned houses in Nishinokawa took on a life of their own. 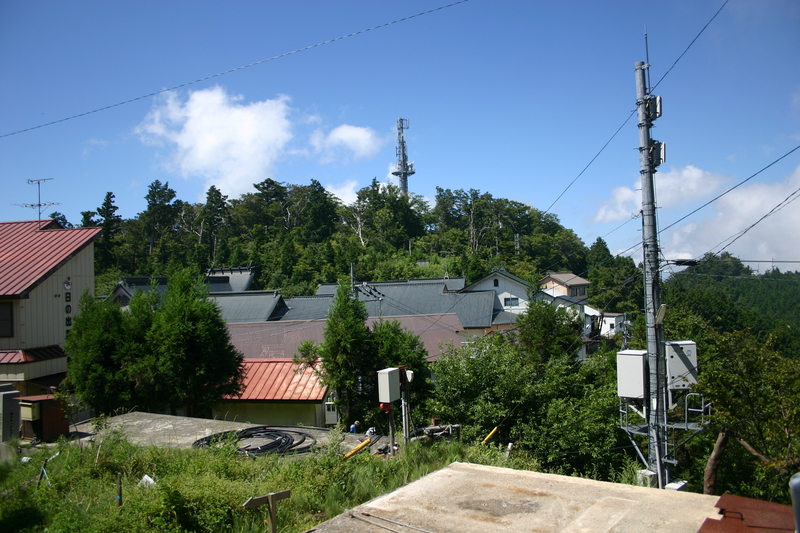 Finally off the trail, I strolled back down the paved road past the ropeway entrance, hoping for the best. I stuck out my thumb at a clearing in the road while an elderly man who’d obviously never hitched in his life tried to put in his 2 cents. I politely ignored his insane suggestions as best I could, knowing that if I’d listening I would’ve either caused an accident or gotten run over. 10 minutes later, a hiker gave me a lift to the expressway on-ramp, where the first car gave me a lift to a rest stop on the outskirts of Okayama. While walking through the parking lot, another car pulled up and offered me a ride all the way back to Osaka. Perhaps the deities had given me a bit more than just spiritual awareness.